Organized violence war, armed revolt, genocide, lynching, targeted killings, torture, routine discrimination, terrorism, trauma and suffering is a daily reality for some while for others it is a sound bite or news clip seen in passing and easily forgotten. Rigorous scholarly research of the social and cultural conditions of organized violence, its genesis, dynamic, and impact, is fundamental to addressing questions of local and global conflict and its impact on the human condition. Publishing peer-reviewed articles by international scholars, Conflict and Society expands the field of conflict studies by using ethnographic inquiry to establish new fields of research and interdisciplinary collaboration. 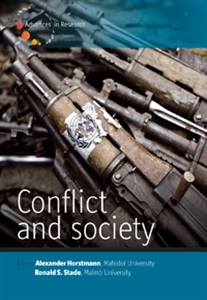 An opening special section presents general articles devoted to a topic or region followed by a section featuring conceptual debates on key problems in the study of organized violence. Review articles and topical overviews offer navigational assistance across the vast and varied terrain of conflict research and comprehensive reviews of new books round out each volume. With special attention paid to on going debates on the politics and ethics of conflict studies research, including military-academic cooperation, Conflict and Society will be an essential forum for scholars, researchers, and policy makers in the fields of anthropology, sociology, political science, and development studies.